Map depicting the dominions of the Nizam of Hyderabad in parts of Maharashtra and Telangana, India. Circar of Nandair in the Dominions of His Highness the Nizam of Hyderabad. This is a lovely map depicting the circar of Nanded under the Nizam of Hyderabad corresponding to parts of the modern day districts of Nanded, Latur in Maharashtra and Nizamabad and Adilabad in Telangana. Issued by Pharoah and Company in 1854, the map notes important towns, rivers, roads, and topography. Circars or Sarkars were historical division of a province used in the Mughal states of India. 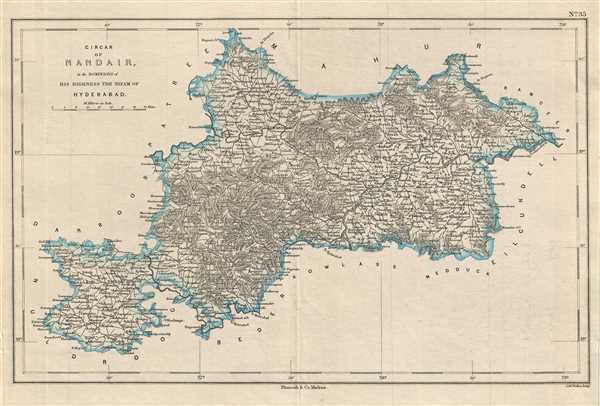 The regions of Naldurg, Kalyani, Bidar and Kowlass were part of the princely state of Hyderabad from 1724 to 1948, until the Nizam was overthrown by the Indian Armed Forces following its independence. This map was engraved by J. and C. Walker and issued as plate no. 35 by Pharoah and Company in their 1854 Atlas of Southern India. Very good. Minor foxing. Minor wear along original fold line.